This is how my coffee tables were decorated prior to starting this project. I keep the decor on my coffee tables very simple so it is easy for me to change things up as the season’s change. The branches in the cylinder vase came straight from my yard and provide a perfect amount of drama for the area. Since my coffee tables are metal and glass, I felt it was important to add some softness to the tables. Especially since it is fall, adding some coziness should be priority one! There are so many things you could use for this…a throw blanket, a tablecloth or a piece of fabric with texture. For this project, I actually found this fantastic faux fur bath mat at Marshall’s on clearance for only $12!! When I found it, I instantly thought it would serve as a perfect base for my plans for the coffee tables. Next, I put the branches back on the table on top of the fur piece. Voila…tons of texture! Here, you should just go for it! Variety is key. Velvet pumpkins, faux pumpkins, real pumpkins, painted pumpkins…whatever your heart desires. For my fall decor this year, I am working with a neutral palette so that is what guided my choices. However, this look will work with any colors you prefer for fall. You could absolutely stop here if you want a cleaner, simple look. However, fall is all about what is happening outside so I like bringing the outside in. Having a large yard with multiple species of evergreen and deciduous trees and plants, I have a plethora of options. If that is not your case, you could easily use natural greenery you can buy from your local grocery store or faux greenery or branches bought from any hobby store. I chose these chokecherry branches because of their color but also because they will dry well and last a long time. To feature more natural elements on my coffee tables, I simply brought in some pine cones from my front yard. We have a constant supply! For me, the finishing touches are so important. 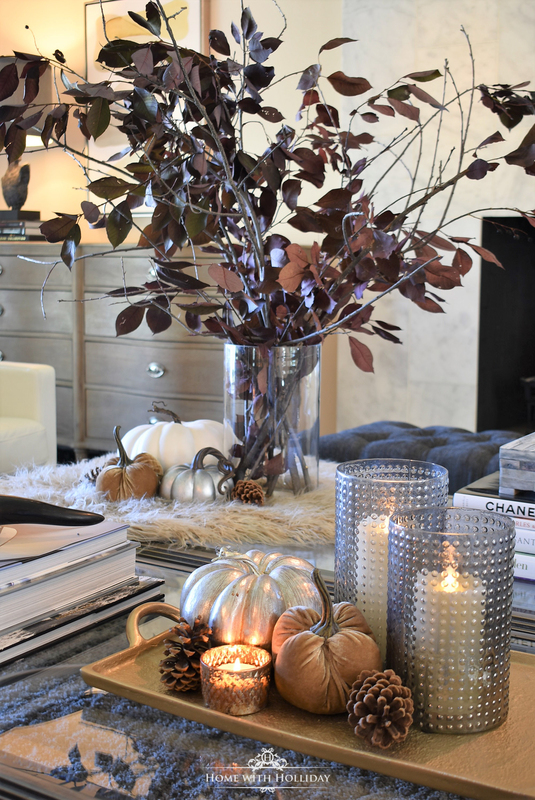 Adding candlelight is a must-do to help create a cozy, fall vignette. It provides warmth and ambiance that cannot be matched. To better understand why I chose this color palette, here are a few shots from some of my previous posts of other fall decor I have designed for this season. To see how I created this vignette, click here. For details on this fall table setting, click here. Thank you for stopping by today to see a few of these easy and creative fall decor ideas. I would love to hear what colors you are featuring in your fall decor this year! 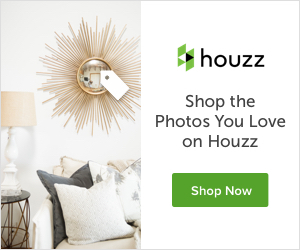 Holliday — Just love all of our great décor ideas and classic style! Love your blog too — one of my very favorites. Out of curiosity, just wondering where you found (or created?) the gold tray shown in your vignette? Lovely. The style looks familiar to me. Your neighbor to the south — new mexico. Holliday – Thanks for compliment. That tray is just killer! will look around for something similar. not beyond painting one up if it fits the bill except for color! I live south of santa fe — between abq and santa fe in placitas, NM. very magical here. Love the silver tones for your fall table. Wow you really know how to style that coffee table. I would not have thought of half of the things you added. It looks sophisticated but warm, just perfect for fall. Thanks for the inspiration! Holly… love those beautiful burgundy branches, and the pillar candle holder are so lovely! Pinned on my Fall board!